It’s that time again – for turning over a new leaf, for re-examining our work and life, for refocusing on what we really want, and for refreshing our commitment to the things that give us passion and meaning. Happy New Year! The start of a new calendar year is an obvious time to talk about new beginnings and fresh starts. We are passionate about supporting those we are honored to serve as they meet their potential and exceed their greatest goals. Every decision made by The Haven has a clear purpose to empower and provide opportunities to live a meaningful life. In 2018, dreams will become reality for many of the goals our board of directors and senior leadership team have envisioned in 2017 and we are grateful that you have joined us on this journey. Take a look below to see some of the AMAZING accomplishments of 2017 and stay tuned for a 2018 message from our CEO in the New Year! This year we made renovations to both of our original residential homes: Suncoast and Friendship House. Refreshing updates were made to create a revitalized environment for those who call The Haven home and to align the residences with the freshly modern look of our most recent housing additions. This October we unveiled the NEW Frank Stern Employment Training Center which will add up to 100 new employment and life skills opportunities for adults with disabilities in the coming year. We have expanded and added new programs like Careers Without Limits – an Able Trust funded program serving currently enrolled college students who identify with a disability – to our menu of vital programs and services for children and adults with disabilities. You lent a helping hand, both literally and financially, following Hurricane Irma to get the community back in working order and you exceeded our $30k fundraising goal to repair the damage the Adult Day Training building sustained. We shared in the excitement of the 20th Anniversary Jingle and Jog 5k, the most successful race to date, with over 550 registered racers and nearly $50k in support through corporate sponsorships, donations, and day-of-event raffle sales from the Sarasota Ford Holiday Car Raffle. Year-end giving is on the rise showing us that more people find value in the good work that we do in Sarasota-Manatee. Because of community partners like you, we are able to continue our mission to be a resource for independence and a champion for inclusion, in all aspects of life, for people with disabilities. With gratitude and excitement The Haven is ready to embrace 2018 with open arms! 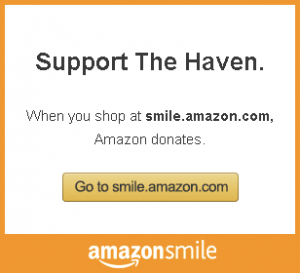 The Haven is a 501(c)3 not-for-profit organization as established in 1954 by the Community Haven for Children and Adults with Disabilities, Inc.